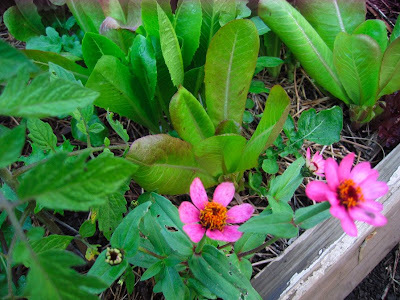 Some renegade dwarf Zinnias growing amongst the mesclun. Salad is becoming a bit of a bore lately. I try to add different ingredients to keep it interesting... Pineapple chunks one night, dried cranberries and pecans another. Conn even threw some green olives in there one night. 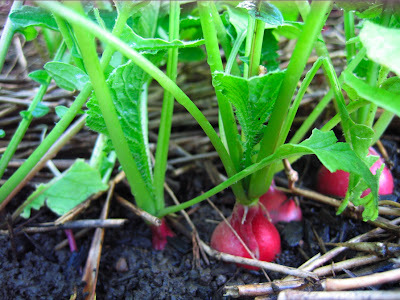 Plant a radish, get a radish! 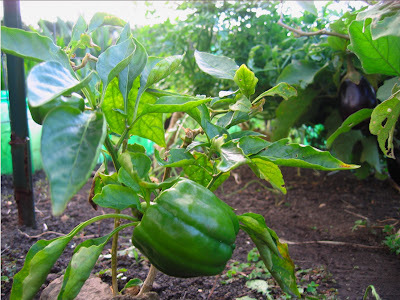 We have a few peppers growing on various pepper plants throughout the garden. The plants themselves take a very long time to grow, I planted most of them over a year ago. I'm sure I could get them to grow faster with some extra somethin' somethin'! 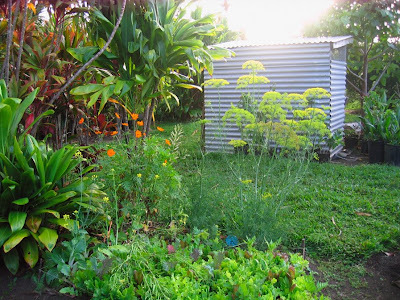 Here's a carrot patch that's growing well next to a patch of celery on the right. The giant blue-green thing is kale. I left it to provide some shade and it's growing into a nice shrub! I thought i'd lost it to aphids a few times but it's a fighter. 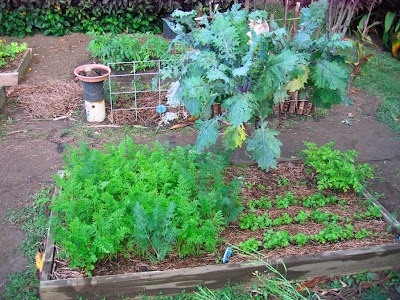 The blue-green plant in front and center of the carrots are a renegade dill. Along a wire fence are some lima bean plants. 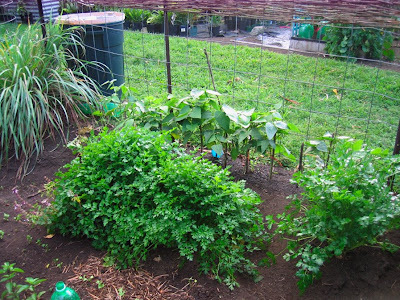 The big parsley patches provide some much needed wind protection. At the top of the pic you'll notice a weave texture. One day after trimming the hibiscus hedge i had the idea to weave some of the green and pliable cuttings into the wire fence. it turned out to be too time consuming so i stopped with just the top rung. But I think even just that band across the top looks nice. It help straighten out the fence too. This shows one of 3 corn patches. Some cilantro seedlings, strawberry, eggplant and lemon basil (lower right). The strawberries were harder to grow than expected. 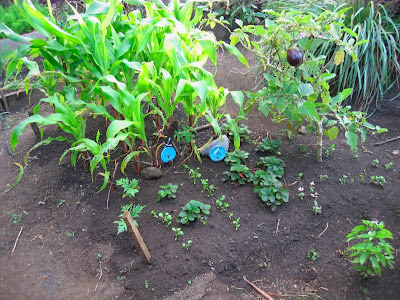 They get trashed easily by bugs and slugs. And the yield is very low. But I left a few of the plants around and underneath the eggplant. I transplanted two cosmos from different parts of the garden here in hopes that they'll provide some shade for the tender cilantro. This is a view from the "entrance." 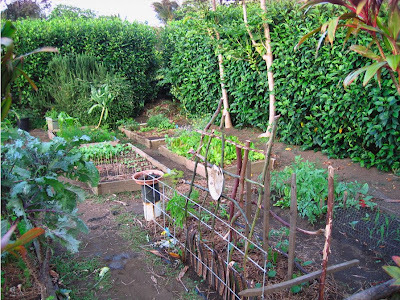 The sticks on the right are a trellis for the beans if they ever start climbing. I weaved them into a thick metal grid at the base, and also stuck some royal ponciana pods at the bottom to help protect the newly transplanted seedlings. Yeah, salads can get boring. . . I always love a good Greek style salad or apples/pears w/blue or gorgonzola cheese and walnuts. And here I use poppyseed dressing -but there it's always papaya seed! Love the woven pods with the beans...clever. Are you into growing flowers too? Orchids? Gardenias? i love your conversational tone, nuey. "here are carrots, there is some tender cilantro" you are a dear, wonderful gardener. 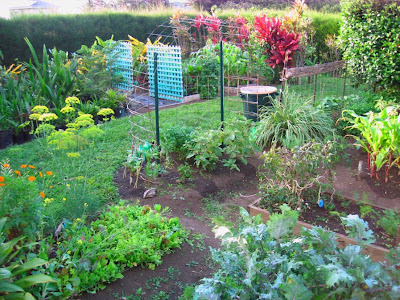 When I daydream about moving to Hawaii, which I really hope to do someday, a garden the size of yours is always included... How lovely.